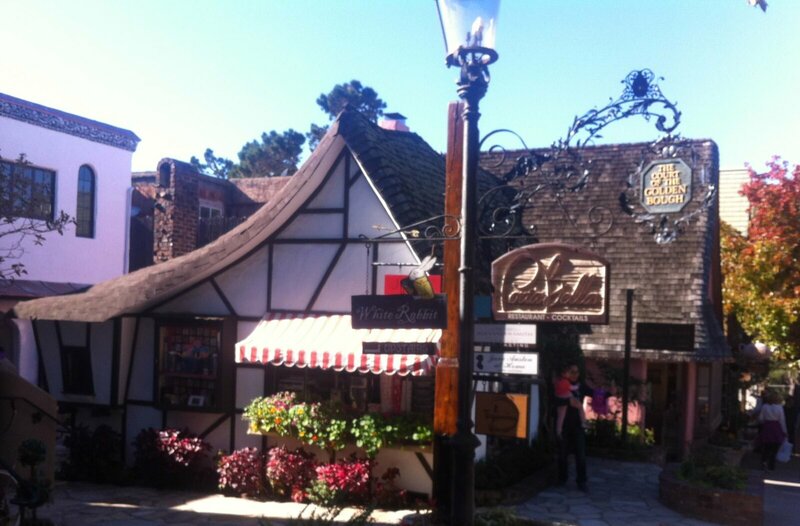 Visiting Carmel is like stepping into a fairytale land. 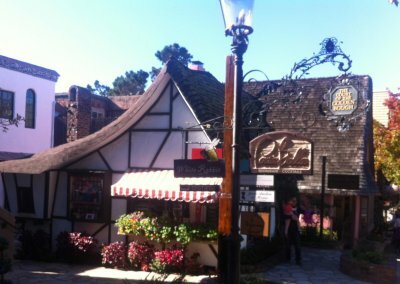 This quaint village is neatly tucked on a wooded hillside overlooking the ocean, and populated with adorable hobbit-like cottages. Accordingly, the town center is comprised of curlicue-roofed shops and stone-paved alleyways that open into surprise courtyards. With outdoor malls, family-owned boutiques, coffee shops galore and wine tasting everywhere, give yourself ample time, because shopping in Carmel is a delight. For those with eclectic taste, the “Heart Beat Boutique” (Ocean & Monte Verde), carries Bohemian apparel along with a bit of everything, from skulls to disco balls. 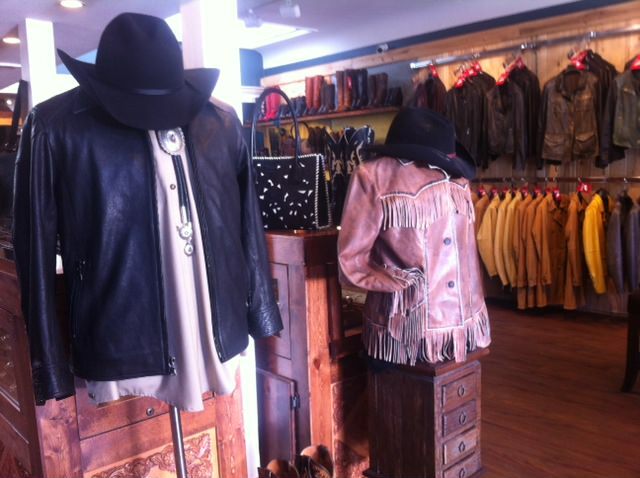 Once you meet the owner, Teresa Bradford, the unconventional store makes perfect sense. Teresa is a little bit of everything herself – dabbling in photography, jewelry design and curating her store with items from people she feels a connection to. 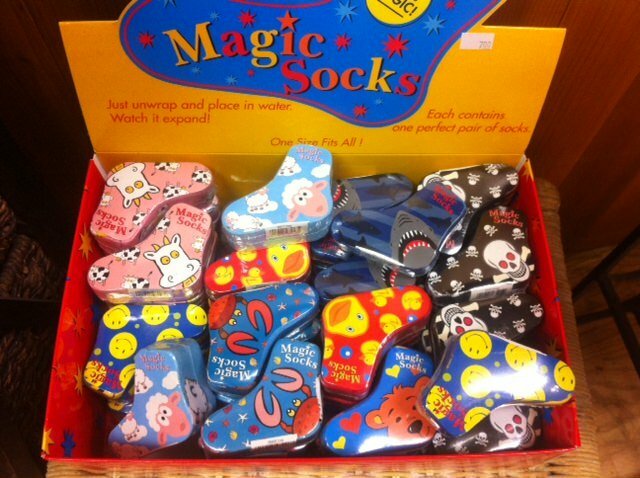 Heart Beat is the place to go treasure hunting – you never know what you’ll find. For designer furs and luxury leathers, try Augustina’s. Priding themselves as a one-stop-shopping place, store owner Tracy Delaney Odle claims: “If you lost your suitcase we could replace everything for you; we custom design to fit anyone.” Augustina’s has designed for many celebrities, including Barbra Streisand, and they’re the only boutique in the USA that carries Paula Lishman hand knitted beaver fur. Boasting world-renowned artisans, Augustina’s is also the only certified dealer in CA that specializes in making belt buckles for the stars. They’ve made buckles for Roy Rogers, Clint Eastwood, and Gene Autry, to name a few. If country western is your style, stop in at “Burns Cowboy Shop”, a family owned business since 1876. 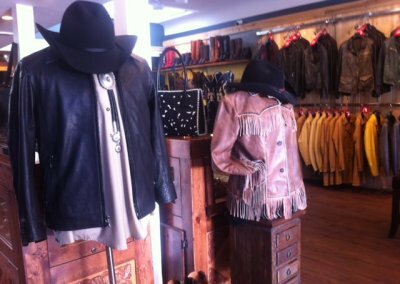 This store has all things cowboy: boots, rhinestones, tassels, leather jackets, Stetsons, and surprisingly pink shirts – who knew Cowboys wore pink? The Wild West experience is complete with country music. playing and animal hides decorating the walls. 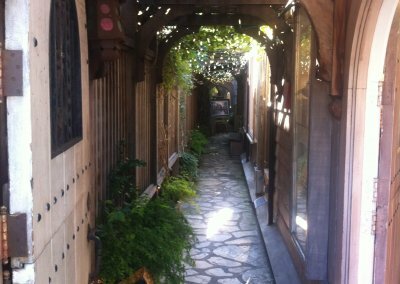 Meander down the alley alongside Pat Areias Jewelers, and tucked behind you’ll find the Thomas Kinkade Garden Studio that resembles an actual Thomas Kinkade portrait. 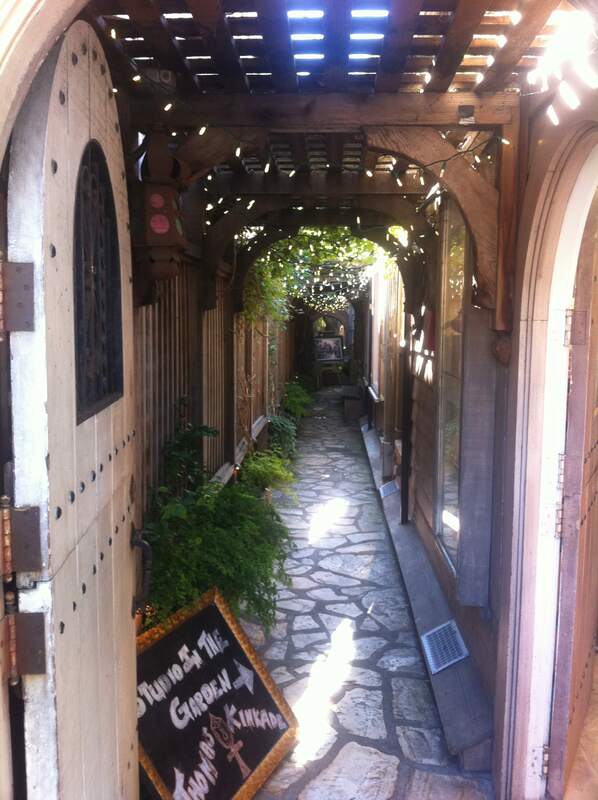 Around the corner is the Galante Vineyard wine tasting studio – stop in for a quick sip. 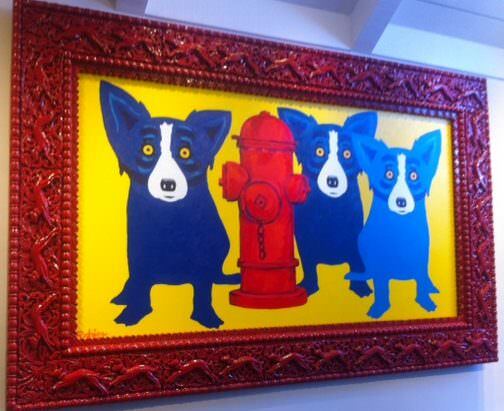 Then peruse the art gallery of George Rodrigue. 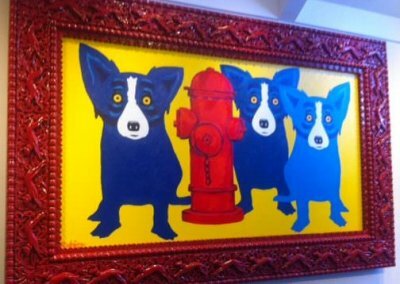 Here you’ll find paintings of the famous blue dog (whose real name was Tiffany). A large painting of this abstract pop art (which is based on a Cajun legend) sells for a whopping $220k. Need a festive raincoat? Try Fashion Street Boutique. Want Frida Kala socks? 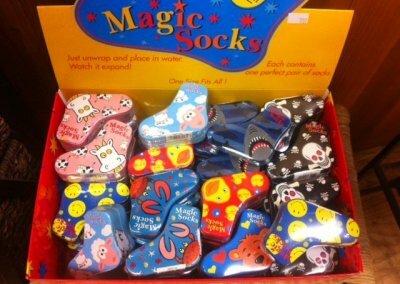 Try the Sock Shop (they also have magic socks that need to be dipped in water to “grow” to full size). For food lovers, step into Kurtz Culinary to sample award-winning gourmet foods, including farm-fresh jams, artisanal tapenades, wine jellies, and other specialty foods. And for those with children, try “Starchild” – a nicely displayed high-end store for kids ages 0 to 14. Of course, Carmel also offers the fashion staples of Coach, J. Crew, Anthropologie, Tommy Bahama, Tiffany & Co, and plenty of luxurious shops and gourmet dining. Plus, romantic places to stay. The Mission Ranch comes highly recommended. 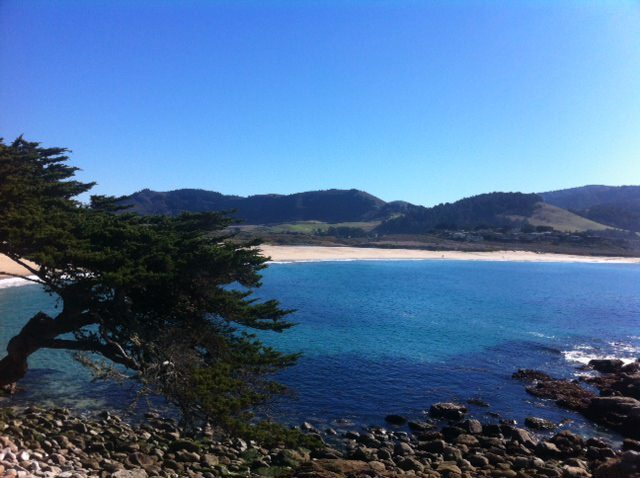 An 1800’s ranch preserved and restored by former Carmel Mayor (and longtime Carmel resident), Clint Eastwood. Eastwood rescued this landmark resort from condo developers, and renovated the entire property to provide a unique resort experience. 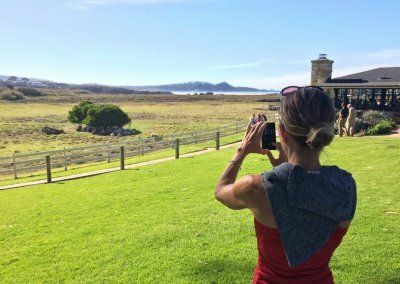 The historic Mission Ranch sits on 22 acres with spectacular views and sheep grazing in the fields – it’s like being a painting.